Providing Sanctuary and a Forever Home since 1984. A not-for-profit 501(c)3 marine mammal education and research facility for 35 years. A not-for-profit 501(c)3 marine mammal education and research facility for more than 35 years. Please do not attempt to approach or assist the manatee. Above all, do not get into the water. Manatees are normally very gentle, but they are still wild, powerful animals and can weigh up to a ton! Getting in the water puts you at risk, and your good intentions may scare away the injured animal and prevent professional rescuers from giving it assistance. Your call will be answered by the Florida Fish and Wildlife Conservation Commission who then contact and alert the rescue teams. This is the first step in launching a trained, authorized response to aid the animal(s). Nobody else can put the process into action. The Florida Keys has a population of manatees that make their home up and down the chain of islands throughout the year. When ocean temperatures drop, more manatees make their way from mainland Florida to the Keys, so the population increases at a time when there are also more people visiting and more boats out on the water. Now, as much as ever, manatees need your assistance. If you see a manatee with an entanglement, an injury or displaying behavior that appears to indicate distress, please call the telephone number above immediately. These names belong to some very special visitors in the Florida Keys. They are only a few of the endangered manatees who either frequent our waters now, or have done so in recent years. Why do these wild manatees have names? The answer is both simple and sad. At one time or another, each of them has been rescued from life-threatening situations, some of them multiple times. Some were entangled in discarded fishing line or synthetic boat rope. Others were hit by boats and severely injured by propellers slicing into their bodies. Unfortunately, not every manatee recovers from its injuries, but many do, and every member of this beloved species needs us to continue our efforts. 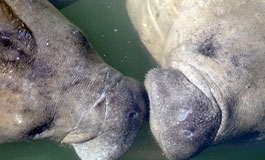 Whatever the case, these animals were in jeopardy and over the years, Florida Keys residents have initiated hundreds of calls to report manatees in distress. Thanks to you, many of these endangered animals have been successfully rescued, treated and released back into their ocean home. According to recent counts, there are only about 6,000 manatees left. The very survival of these endangered animals is at stake. Dolphin Research Center is licensed to rescue, verify the location and condition of manatee(s) injured and/or distressed in a primary response area that includes, primarily the Southeastern United States, along the Atlantic Coast and the Gulf of Mexico but could be anywhere within the United States upon request of the Fish and Wildlife Service. Dolphin Research Center is the only state and federal government authorized Manatee Rescue Team in the Florida Keys. Dolphin Research Center does not house manatees at the facility as a rule. We are licensed as a temporary rehabilitation/holding facility for manatees for up to 48 hours but primarily transport injured and/or distressed manatees to designated rehabilitation facilities. Professional, specially-trained, experienced assessors, rescuers and medical personnel make up our team. The training is crucial to reduce the risk of injury to both manatee and mankind during a rescue. We work closely with the state and federal entities responsible for overseeing the welfare of manatees. Dolphin Research Center is a non-profit 501c3 organization. We do not get paid to rescue manatees. We rely on donations from generous, caring people like you who join our Membership Programs to support these efforts. Knowing of the need for trained rescue response, we decided to commit our limited resources to helping manatees in the Florida Keys. Over the years, we've responded to hundreds and hundreds of calls. With your help, we will continue to do so in the future. 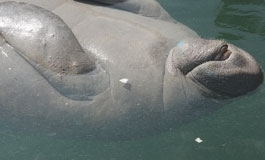 To help support DRC’s manatee rescue efforts consider becoming a Member. All Dolphin Society Memberships support manatee rescue and receive the quarterly Manatee Rescue newsletter. MANATEES MATTER IN THE FLORIDA KEYS – This endangered species needs your help! Dolphin Research Center is licensed to rescue, verify the location and condition of manatee(s) injured and/or distressed in a primary response area that includes, primarily, the Southeastern United States, along the Atlantic Coast and the Gulf of Mexico but could be anywhere within the United States upon request of the Fish and Wildlife Service. Dolphin Research Center is the only state and federal government authorized Manatee Rescue Team in The Florida Keys. All DRC’s rescue efforts are voluntary and are supported by private members and donors.Help support Dolphin Research Center’s manatee rescue efforts by becoming a Member. All Dolphin Society Memberships help support Manatee rescue. You may also wish to help by visiting our Manatee Rescue Donation Wish List. If you love them, please don't feed them or give them water! 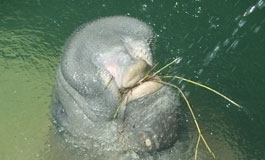 Manatees' natural feeding behaviors adequately meet their nutritional requirements. They don't need water or lettuce. 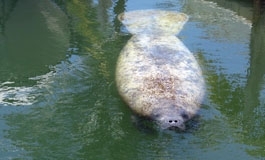 Handouts from humans result in manatees frequenting busy marinas and canals where they are more likely to become entangled in ropes or hit by boat propellers! Respect posted slow speed zones when boating and stay alert when traveling in shallow water. Manatees do not swim fast! They may not be able to dive or swim out of your way in time. Wear polarized sunglasses which will enable you to better see manatees that might be swimming below the water’s surface. If you spot a manatee, remember that other animals might also be in the area. Discarded monofilament fishing line, synthetic rope, plastic bags, cigarette butts and all other forms of litter are extremely harmful to marine life. Bring all your trash back to shore for proper disposal. Fishing line can be recycled at area bridges, marinas and many tackle shops. Admire them from a safe distance! Observing these amazing creatures is a thrill! Watch and take pictures from far enough away so you don't scare off the animal. Please don't accustom them to humans by swimming near or trying to touch them. Manatees are protected by the Marine Mammal Protection Act of 1972, the Endangered Species Act of 1973 and the Florida Manatee Sanctuary Act of 1978. It is illegal to feed, water, harass, harm, pursue, hunt, shoot, wound, kill, annoy or molest manatees. 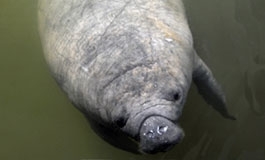 The state of Florida has also established regulatory speed zones to protect the manatee and its habitat. Anyone convicted of violating state law faces maximum fines of $500 and/or imprisonment of up to 60 days. Conviction for violating federal protection laws is punishable by fines up to $1000,000 and/or one year in prison. Our Mission - Through education, research and rescue, Dolphin Research Center promotes peaceful coexistence, cooperation and communication between marine mammals, humans and the environment we share with the well being of DRC's animals taking precedence.